For the true fans of truffle and vegan cheese, Trufflehound is your fix for both flavor cravings in a flawless pairing from Reine Royal Vegan Cuisine! Luxurious vegan cashew cheese has the perfect balance of genuine black truffles blended in, along with white truffle oil, and a hint of garlic and onion. Perfect for topping off a crusty slice of toasted baguette or your favorite crackers, if you've been seeking the ultimate vegan cheese with real truffles added, you've found what you're after! 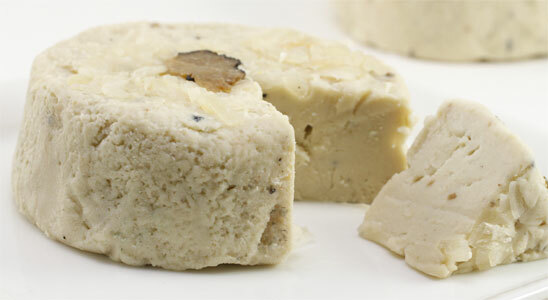 Reine artisanal vegan cheeses are made in small batches with high-quality organic ingredients. Each exceptional cheese contains no soy, dairy, gluten or GMO ingredients, and are free of gums, starches and fillers, made only with the finest natural whole-food based ingredients. Rich with live probiotics and aged 30-60 days for maximum flavor, Reine cheeses have a natural tanginess that's reminiscent of aged dairy cheese, but of course, it's 100% vegan! 100g (3.57 oz.) Trufflehound Cheeses are $13.49 each. From Leeza of New York, New York on 2/2/2019 . Nope - this is not the "ultimate vegan cheese." This is THE ULTIMATE CHEESE. FULL STOP. The perfect slight truffle earthiness is exactly right - hearty and delectable. The feel of this wonderful cheese on the palate is not to be missed. This splendid cheese puts the tastebuds on full alert! Splendid cheese. No one needs to recommend ways to enjoy this cheese. Just google: How to eat the world'ss finest cheeses. Fabulous. Fabulous. Fabulous. Bravo! From Diane T of Englewood, New Jersey on 12/16/2018 . OMG!!! I purchased this on a whim, seeing as how it's the holidays and I wanted to treat myself to a new vegan "cheese." I was really hesitant, especially given the price. But as soon as I opened the wrapper, I was transformed to a blissful dimension where price was no object (sigh...), a place I haven't been since I stopped eating dairy! This beautiful little mini-wheel captures PERFECTLY the essence of a delicate ripe cheese strafed through with (OMG!!!!) luscious truffles and heady truffle oil. One bite and my body was trembling with joy. (Yes, it's that bad! I LOVE those rich aged cheeses and REALLY miss them, and i CAN'T BELIEVE how Reine Royal Vegan Cuisine has perfectly captured that essence!!!!) I treasured my little ring for over a week, taking little wedges at a time on crackers, toast, on a veggie burger...ahhh!!! I'm ordering another of their cheeses with my new order....SERIOUSLY can't wait!!!! Thank you for restoring a foodie experience that I thought was gone for good : ) !